Cows are known to be smart and emotional beings. 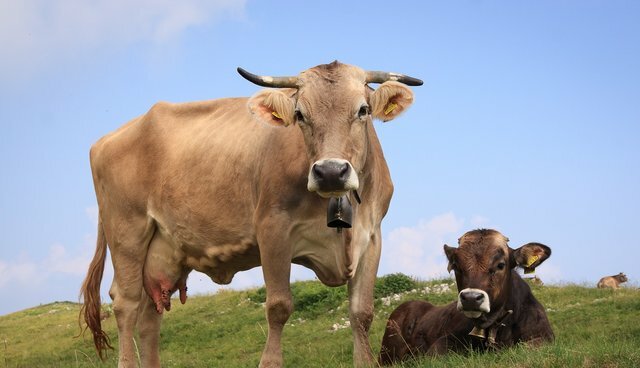 For example, we know cows experience positive emotions such as joy and they like to play (for a discussion of the wide range of emotions cows experience please see "Sentience in Farm Animals") and that calves suffer when separated from their mother and that dehorning is very painful. In a research paper called "Separation from the Dam Causes Negative Judgement Bias in Dairy Calves," Rolnei Daros and his colleagues clearly showed that dairy cows suffer negative emotions and can become pessimists due to the pain of separation and social loss. Cow faces are not all that expressive and it's often difficult to know what's happening between their ears. Of course, this does not mean that they aren't feeling deep emotions and thinking about what is happening to them. And now, we have very important and useful data clearly showing that a cow's ears can tell us a lot about what they're feeling. examined whether ear postures in dairy cows were reliable indicators of a low arousal, positive emotional state. We conducted a total of 381, 15 min focal observations, across a group of 13 cows, using stroking as a positive stimulus. Each focal observation was comprised of three, 5 min segments; pre-stroking (baseline), stroking (stimulus), and post-stroking (post-stimulus). Throughout the focal observation, one researcher filmed the focal cow's ear on the side which was to be stroked, and a second researcher recorded the focal cow's behaviour. During the stroking segment the third researcher, who was present in the cow pen throughout, stroked the habituated cow on certain regions of their head, neck and withers for 5 min. Following this, the stroker left and the filming and behavioural observations continued for another 5 min (post-stroking segment). To eliminate extraneous variables we controlled for activity levels and other behaviours thought to be positive such as feeding. Prior to video analysis we identified four ear postures; an upright posture (EP1), a forward ear posture (EP2), a backward ear posture (EP3), and a hanging ear posture, where the ear fell loosely, perpendicular to the head (EP4). We then analysed the video footage to determine the duration of time spent in each of the four ear postures, and the number of ear posture changes performed during each segment. The results of this important study show that "ear postures are indicative of what is suggested to be a positive, low arousal emotional state in dairy cows and could therefore be a useful, non-invasive measure of emotional state when used by trained observers." I want to call attention to this paper because it shows it is easy to assess a cow's emotional state and that this information can be used to improve their lives. As the authors note, "Studies such as ours seek to address the lack of knowledge of positive emotions, and successful results enable animal welfare scientists to work towards ensuring a good life for animals ... Furthermore, positive treatment of dairy cows and the promotion of positive emotional states has also been shown to have beneficial effects on milk yields ..."
We owe it to these and other animals to give them the very best lives we can. And, often, it's easy to assess what they're feeling and we must use this information on their behalf.